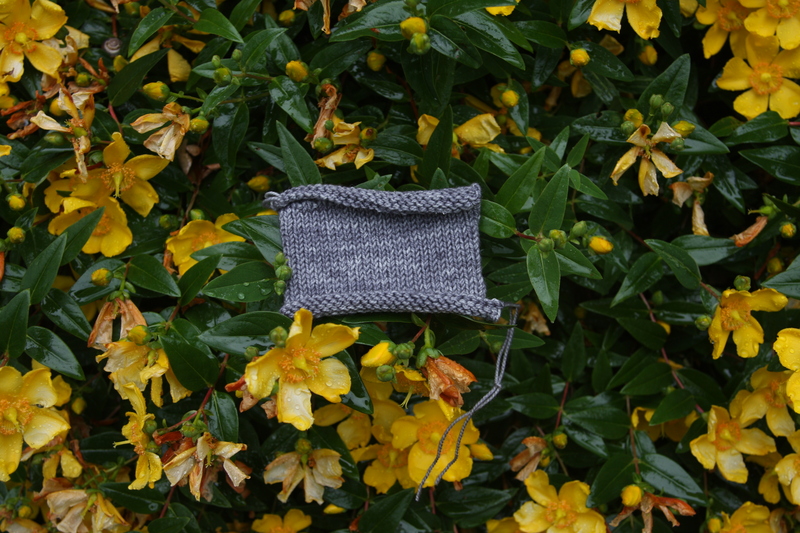 The first step in our Skirt Project is to knit up a sample skirt; a template for the later designs. We want to make sure that the fit is right, and also that we are happy with the chosen yarn, gauge, fabric, drape, shape, style, etc. 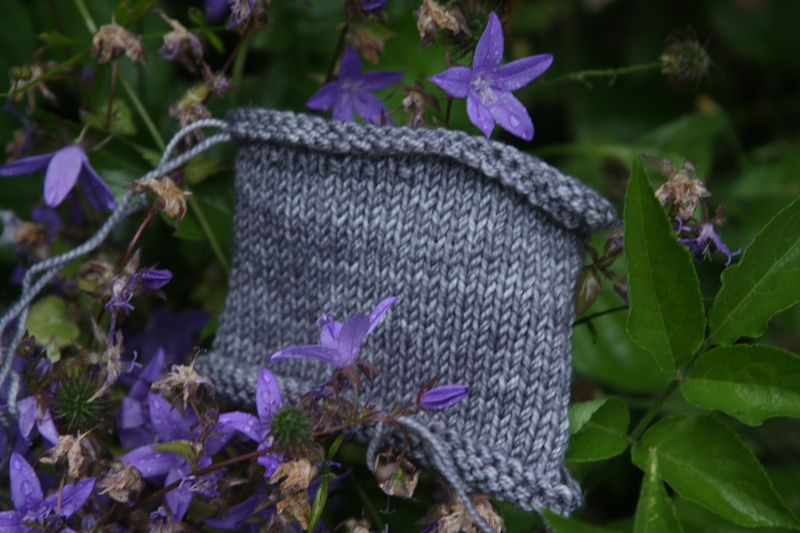 The initial plan is that I will ponder over the basics involved in designing and knitting the template (and knit it, of course!) while Emma is busy with designing the first series of skirts. Of course it is a much more collaborative process than that implies, since we are bouncing ideas back and forth nearly every day. 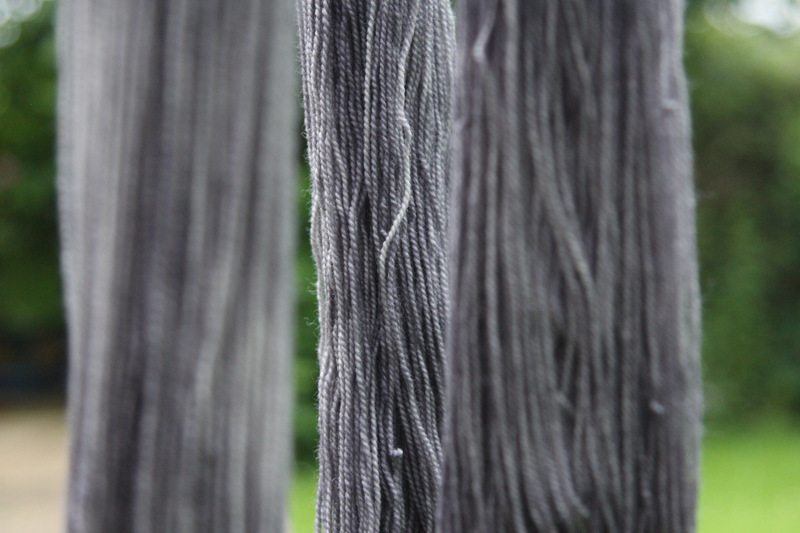 There are three major decisions that I have been grappling with: top-down or bottom-up, back-and-forth or in-the-round, and which yarn to use. 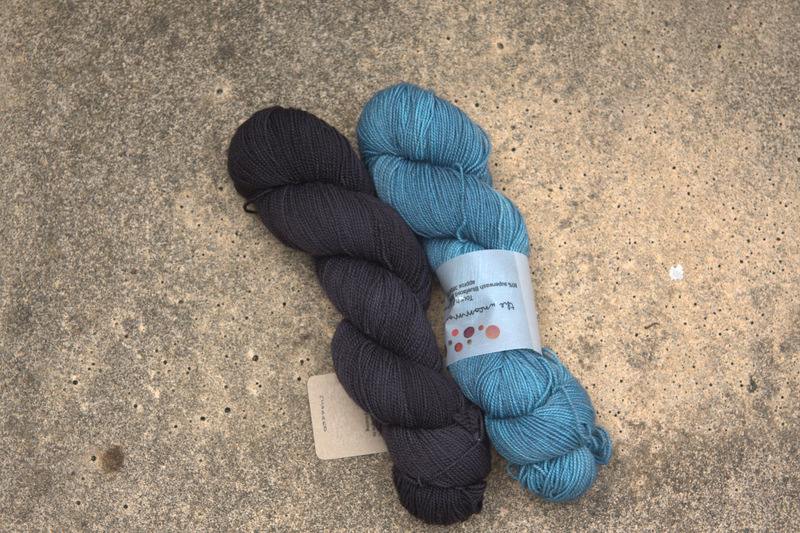 This post will focus on the yarn selection and I will discuss the other two in the next post in this series. A skirt needs to have some sturdiness built into it. The skirt has to give and move with your body, but you don’t want it to sag and bag. Essentially, you need to be able to sit and stand, repeatedly, and wash it frequently, and you don’t want it to stretch out or to pill. It needs to have memory, and to “sproing” back into place. 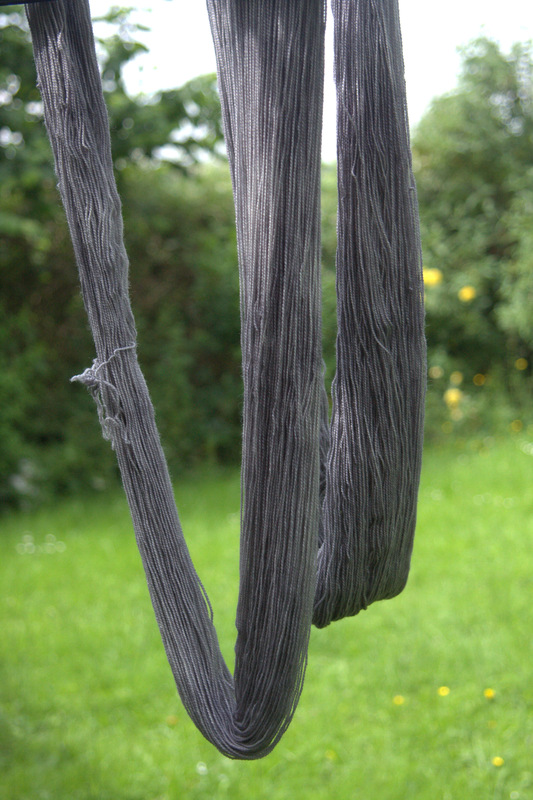 I decided that I wanted wool, which has great drape and memory, but with some nylon mixed in to make it tough. Sort of like sock yarn, I pondered. In fact, what I want from the fabric for the skirt is similar to what you want with a sock – it needs to be able to take a lot of abuse and hold up to wear and tear. The problem with sock yarn is that the gauge is too small. As Emma keeps planning for more and more skirts, I must keep the gauge to something reasonably quick. I thought about it and decided my preferred needle size would be a US5 or 6, and that I would be aiming at 5-6 stitches per inch. After pondering some time on the pros and cons of various types of yarns, I decided that I would try to use a sock yarn but knit with it held double. 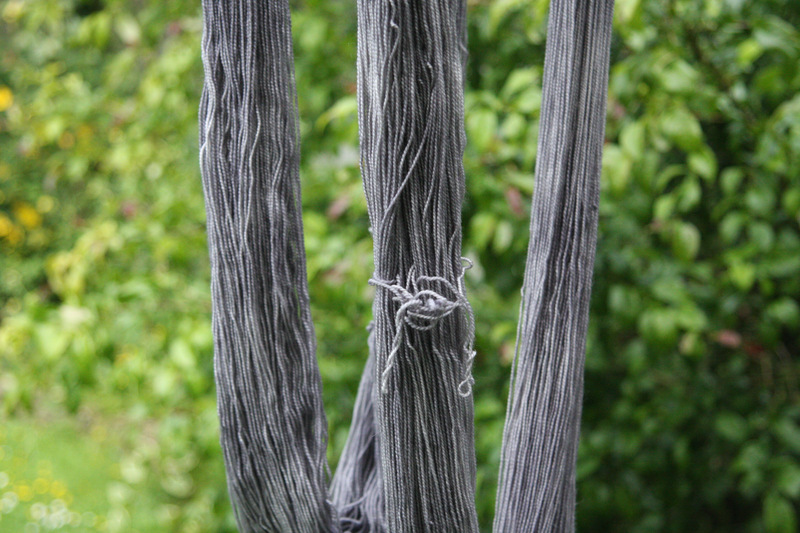 This serves two purposes – it puts the gauge in the range I want and it also means that I can use a beautiful hand-dyed wool without worrying about pooling. The finished swatch is beautiful. The yarn has lots of give, and the colour, with the two strands held together, is even more rich and gorgeous than with a single strand. 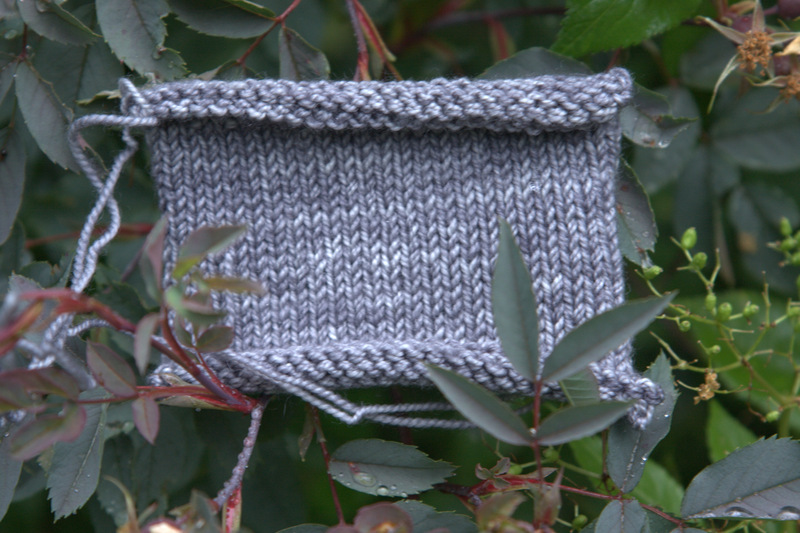 I must admit to knitting the swatch back and forth instead of in the round. This means that I can not be 100% certain that the gauge is accurate. (Clever readers may notice the foreshadowing here for the next post.) But I am impatient, and after all, that is why knitting is made to rip! We knitters can be as impetuous as we like, as long as a little ripping doesn’t faze us. This entry was posted in Main, The Skirt Project Chronicles and tagged design, Knitting, The Skirt Project, The Uncommon Thread, The Uncommon Thread Tough Sock by knitigatingcircumstances. Bookmark the permalink. I am so excited to watch this project unfold!